Successfully Added Hands Free Car Kit + Wireless Earphone to your Shopping Cart. Car use hands free car kit and a rechargable wireless earphone for safely making phone calls on the road while driving. 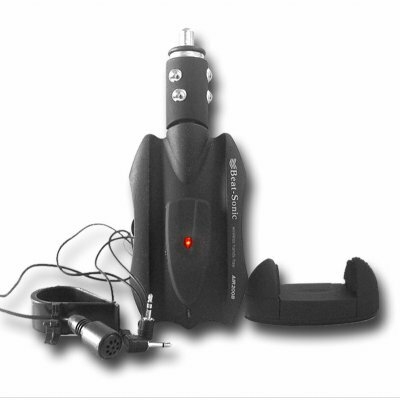 This car gadget features a transmitting range of 3m for the wireless earphone, is powered directly from the cars own battery, and a loud speaker as well as the wireless earphone for letting everyone hear or for privacy. To make it work, simply place the mobile phone in the included carriage, plug the wired MIC into the phones 2.5mm earphone jack and into the car adapter kit, place the MIC on a sun visor or you shirt, and you will be ready to make and receive calls safely on the road This is a high-performance car gadget, and is available at an incredibly low wholesale price..